As part of Artweek Boston, on May 3rd, from 4-6 pm, you will have a rare opportunity to attend an exclusive historic sign painting presentation and demonstration being held at Restoration Resources in Boston, led by Josh Luke, and Meredith Kasabian of Best Dressed Signs. Best Dressed Signs specializes in hand painted signs and murals, gold leaf, and custom lettering and design. According to Kasabian, “The trick of adhering gold to window glass was a very closely guarded secret among sign-men in the 19th century which today can generally only be shared or passed on through participation in an apprenticeship system or attendance at a limited number of trade schools which are rapidly on the decline. With the 2011 closing of Boston’s historic Butera School of Art, one of the country’s last sign painting schools, the artistry of hand painted signs and gold leaf is in danger of dying out in this city. 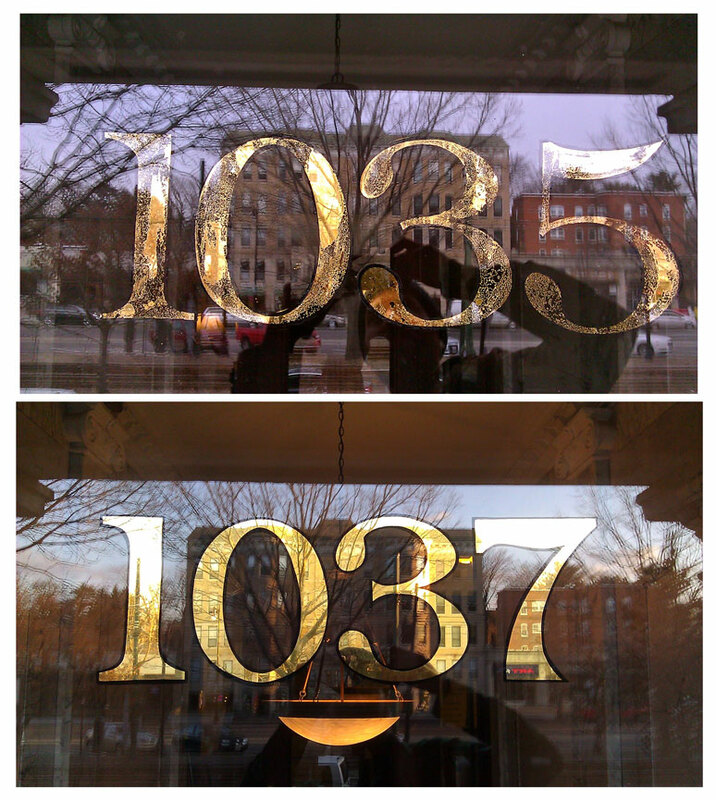 This is especially ironic, given that one of the most widely used glass gilding techniques the “Boston Style gild” which features matte gold centers, mirrored gold outlines, and a black outer outline, was derived from our city’s sign legacy. If you see any old gold leaf signs or transoms around the city, chances are they are done in this style. As part of the demonstration at Restoration Resources, Josh Luke will show how this technique is achieved and Meredith Kasabian will discuss a brief history of gold leaf on glass and explain why it should be the chosen method for anyone desiring gold leaf. Restoration Resources is regarded as “New England’s Primary Source for Exceptional Antique Architectural salvage, Unique furnishings, and Vintage Artifacts” and like Best Dressed Signs shares a commitment to preserve the history, artistry and craftsmanship of items painstakingly made by hand, decades ago. This event partnership enables attendees to explore the beautiful pieces salvaged from the past that are currently for sale in the store’s 7000 Sq. ft. retail showroom and warehouse while also getting a chance to see an exhibit of some of Josh’s work, and learn first hand the century old tradition of hand painted signs. Saturday’s event includes complimentary refreshments and takes place within Circa, the newly launched event venue at Restoration Resources that doubles as a second showroom, and is furnished with salvaged pieces such as a vintage bar, piano, and historical artifacts circa 1800. Recently, Best Dressed Signs was commissioned to complete a hand painted gold leaf sign for Circa, which will be revealed the day of the event. Again, as an added bonus, if you are interested in commissioning Best Dressed Signs to create a sign for your home or business, the company will be offering a 10% discount to attendees on the day of the event.